Who says it's better to give than receive? While it may still be true overall, many more women are including themselves at the top of their holiday shopping lists this year. As part of the POPSUGAR Insights 2017 Holiday Report, we asked 3,000 US women to tell us how much they plan to spend on beauty and personal care this holiday season and who they plan to purchase beauty gifts for this year. Overall, 65% of millennial women plan to spend up to $99 on beauty and personal care gifts for themselves or for others this holiday season. Nearly 1/3 of millennial women plan to spend $100 or more on beauty and personal care gifts. Millennial women are planning to purchase beauty products as gifts this holiday season for their siblings (31%), their friends or coworkers (28%), their parents (23%), and their spouse or significant other (17%). 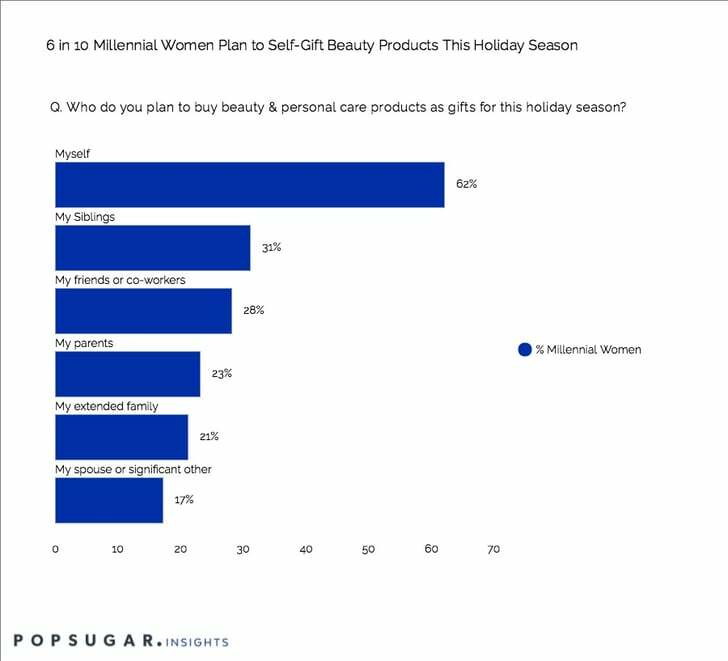 In an interesting developing trend, 62% of millennial women plan to purchase a beauty or personal care gift for themselves this holiday season. Sixty-four percent of younger millennials (age 18-24) plan to purchase beauty products as a gift for themselves.